TOKYO (Bloomberg) -- Toyota Motor Corp., facing rising competition from Ford Motor Co. and Honda Motor Co., plans to keep prices steady for its Camry sedan as it defends the bragging rights for top-selling car in the U.S. The Camry, which has held top spot for 12 years, has seen its lead narrow in 2013, being outsold in April by Honda's Accord and Nissan Motor Co.'s Altima in March. U.S. sales of the car rose 16 percent to 34,780 last month only after Toyota offered incentives that were four times the amount of those for Honda's Accord, according to Edmunds.com. "For incentives, we don't think that our current level is necessarily high, but traditionally, we try not to be too dependent on them," Nobuyori Kodaira, executive vice president at Toyota, said today in a briefing in Tokyo. "I can't really comment on our future plans, but our plan for now is to stick to that as much as possible." The Camry reflects Toyota's broader challenges in defending its lead as the world's largest carmaker amid competition, particularly from Ford, General Motors Co. and Chrysler Group LLC. The U.S. automakers all gained market share in their home market during the first half for the first time in 20 years. "It is true that rival carmakers have come out with very competitive models in the segment, and that competition in the U.S. midsize sedan segment is becoming fiercer," said Kodaira. "What we need to do is to come out with even more competitive models." Toyota seeks to defend Camry's sales lead after the arrival of the revamped Accord, new Nissan Altima and Ford's reworked Fusion sedan. Kodaira declined to say whether Toyota will speed up a redesign for the Camry while acknowledging that competitors have strong offerings. 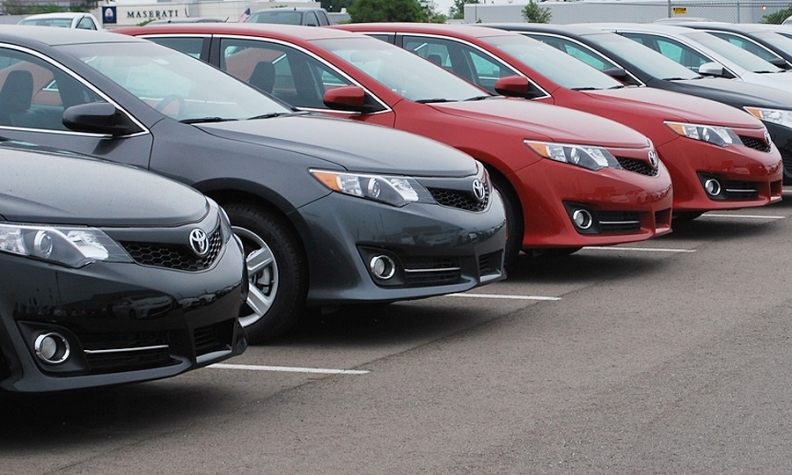 Inventories for both Toyota's Camry and Honda's Civic have risen, Joseph Spak, a New York-based analyst for RBC Capital Markets, said in a report last month. The Camry exceeded its seasonal historical average inventory by more than 15 days supply in June and Honda carried about 25 days more Civics than usual, Spak said. "The Camry is a very important model for Toyota, and it must mean a lot for the model to maintain its market share and position as the best-selling midsize sedan," said Kentaro Hayashi, an analyst at Tachibana Securities Co. in Tokyo. "Unless Toyota's policy to not add too much incentives is something that's firmly secured, their incentives could still be expanded, in order for them to maintain that top spot." Toyota may add safety features to make the Camry more attractive, or bring forward a mid-cycle refresh, like Honda did with its 2012 Civic sedan when it didn't receive the coveted recommended status from Consumer Reports magazine, Hayashi said. U.S. sales of the Camry rose 16 percent to 34,780 last month. Toyota offered four times the incentives than those of Honda's Accord, according to Jessica Caldwell, an analyst at Edmunds.com, a vehicle pricing and data company in Santa Monica, Calif. The automaker has said it expects to sell at least 400,000 of the model this year. Toyota offered incentives averaging $2,581 for each Camry sold in July, compared with $627 per Accord, according to Edmunds.com. While incentives have risen, they aren't out of line for the Camry, Bill Fay, group vice president for U.S. Toyota sales, said in an Aug. 1 conference call. Automakers may sell 15.4 million cars and light trucks in the U.S. this year, the most since 2007, as Americans replace the oldest vehicles ever on roads. On Japan, Kodaira said that a planned increase in the sales tax is an "unavoidable task" and reiterated previous calls by the automaker to scrap levies on auto purchases. Toyota this month cut its forecast for Japan sales in 2013 by 8 percent to 2.22 million vehicles, including autos produced for export. That compares with 2.41 million units delivered last year.